The GMK6400 has earned Manitowoc the Innovation Manufacturer award from the European Association of Abnormal Road Transport and Mobile Cranes (ESTA). 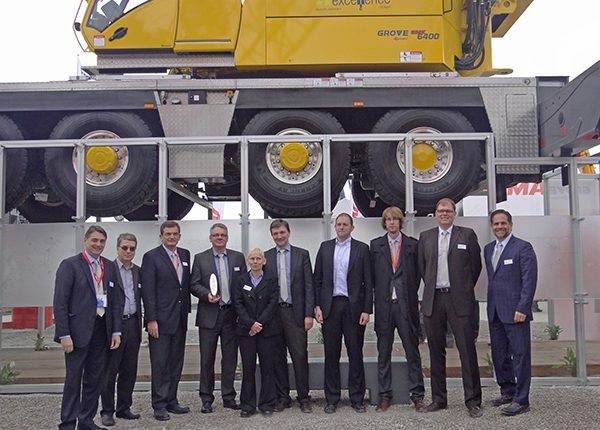 Following the crane’s nomination in 2012, the ESTA named Manitowoc the winner at its awards dinner that took place in Munich, Germany during the bauma 2013 trade fair. ESTA represents crane users from across Europe and presents many awards relating to lifting and transportation projects, as well as the best new products in the industry. Nominees are evaluated and examined by a panel for various design features and other elements before selecting a winner. Jens Ennen, senior vice president of engineering and innovation, accepted the award on behalf of Manitowoc. For the ESTA submission, Manitowoc’s product management team concentrated on four aspects of the 400 t GMK6400 crane. The first was the use of a single engine to power both the carrier and the superstructure. Although this concept is not new in mobile cranes, it is unusual on a machine of this size. In particular, Manitowoc engineers developed a creative solution that would allow the larger engine in the carrier to still efficiently deliver the smaller power requirements of the superstructure. The solution involved several key elements, including the installation of a hydraulic motor in the superstructure in place of the traditional engine. This presented a simpler way to switch power between the carrier and superstructure. Using a power takeoff gear that took only the 240 kW necessary to run the superstructure’s lift operations, provided the engine with an efficient way of working. In the end, the single engine concept delivered significant weight savings that Manitowoc’s engineers were able to reallocate to other parts of the design and further boost capacity. Another design innovation described in the award entry was the crane’s MegaDrive, which gives the GMK6400 both traditional and hydrostatic drive capabilities. The hydrostatic drive gives the crane powerful and exact control when maneuvering at slow speeds on job sites. It only functions when the crane is traveling at below 20 km/h. At speeds of over 20 km/h, MegaDrive disengages and the crane moves using a traditional transmission. MegaDrive offers efficient on-road travel as well as precise positioning on the jobsite. And, as with the single engine concept, this innovation saved space in the crane’s design, allowing further optimization of lifting capacity. The final two design innovations highlighted in the ESTA awards entry were the self-rigging MegaWingLift and the Fuel Saver Option. The MegaWingLift is Grove’s patented tensioning system that can increase the capacity of the crane while the boom is working at a steep angle. In the past, such systems have required an auxiliary crane to install, which is a more involved process with longer rigging times. However, on the GMK6400, the self-rigging MegaWingLift can be fitted in just 20 minutes. The Fuel Saver option, meanwhile, is an intelligent system that reduces fuel consumption during idling, which in regular crane use can constitute up to 80 percent of running time. It is similar to the start/stop function on modern cars, which reduces RPM while the machine is at rest and eventually disconnects the pumps completely, shutting the engine down to save fuel. Restarting the power requires just a quick movement of any of the crane’s joysticks.